I`m michi who lives in Tokyo. I have been teaching Japanses for a year. I usually work as an office worker. I like reading books,watching movies,drinking,eating,etc. 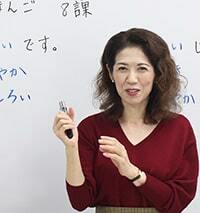 What I can do for you ..
★Lesson are conducted in basic Japanese only. ★I would like to make contents as pleasant as possible for 25minutes to be short. ★I used to play a stage actor before.I studied annoucement. I think that my words sre easy to hear. ・We started a test. I could check my level. It was interesting.